I have recently purchased a luxaflex powerview blind combined with the Hunter douglas hub V2. 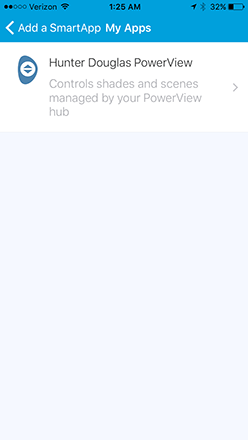 I can control it via the powerview app, but i can’t add it (yet) to the smartthings app. I had read that there is some sort of app written by someone, but i have really no idea how i should get that app onder “My apps”. Can somebody please help me out?? There is a more complex integration with many more features, but you will need the classic version of the smartthings app to make that work, it doesn’t work in the new version. So it just depends on what you need. I am going for the option 2. I saw the post from “Johnvey”, at the moment i am struggling to import the app via repo?? I am using the classic app always, don’t like the other app. You should ask questions about that code in that thread. The author will be automatically notified when new posts are added to the thread, and other people who are using it may also be able to help.